The programme a partnership between Equity Group and Mastercard Foundation, with support of other partners offers comprehensive secondary school scholarships to bright but financially disadvantaged children. The scholarship covers tuition, books, uniform, transport costs and pocket money. The scholars will also receive mentorship and leadership training during their four-year secondary school journey to equip them with life skills that will transform them into leaders.The 2018 class marks the 10th intake of the Wings to Fly program and brings the total beneficiaries to 16,168. This year, Equity Group received nearly 20,000 applications from all counties across the country signalling the nationwide popularity and competitiveness that the program has attained over the ten years of its existence. Speaking during the commissioning ceremony, which was held last month, Education Cabinet Secretary Ambassador Amina Mohammed noted that the Wings to Fly programme has continued to greatly impact bright students from vulnerable backgrounds, who would have otherwise missed the opportunity to explore their talents. “All over the world, a nation’s most important asset is its people. Our future depends on the quality of education that our young people receive, locally and overseas. While education is the biggest item of expenditure in majority of the households in Kenya, the Government sees this as a worthwhile investment that needs to be supported by private and public sector stakeholders,” Amina said. She also noted that the program was complementary to the Government’s efforts to improve access and quality of secondary education as part of its Vision 2030 and is leveraging broader changes to the education system in Kenya, where more than one in four young people still does not attend secondary school. In addition, because of the runaway success of the programme, it has contributed in changing perceptions regarding the importance and reach of good quality secondary education in the country. 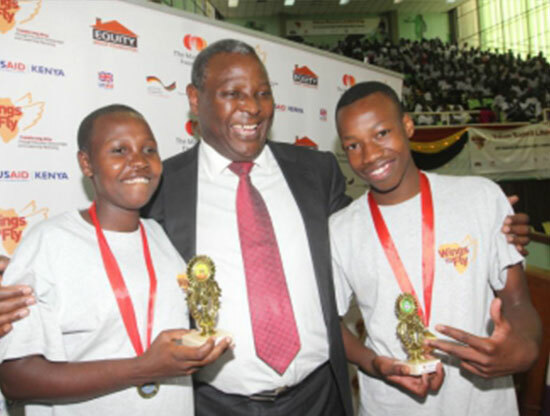 Equity Group Holdings CEO and MD and Equity Group Foundation Executive Chairman Dr. James Mwangi advised the students to take up the opportunity with pride and remember that it came with high expectations. “Receiving a scholarship is also a responsibility – a responsibility towards yourself, family and community. You are now in a position that allows you to give back. You will be the ones who will be able to support those in need and be catalysts of change. This scholarship opportunity demands from all of you a strong commitment and a sense of responsibility. You are going out there to become our ambassadors and role models for our young people across the country,” he said. Mastercard Foundation President & CEO Reeta Roy represented by Timothy Chege the Regional Director and Country Representative, Kenya reiterated that the continued support for the Wings to Fly Programme is anchored on the positive impact that the programme has had and continues to manifest itself in the lives of the students, their families and their community. “Our support is geared towards ensuring that that academically talented students from disadvantaged or marginalized communities are able to attend quality educational institutions and can develop the knowledge and skills they need to join the next generation of ethical leaders. The vision of Mastercard Foundation is that these young people will make a lasting impact in their communities and regions, ushering in a new era of equitable and inclusive prosperity,” Reeta said. To date, a total of 16,168 have benefitted from the Wings to Fly programme. The Wings to Fly Scholars continue to excel with a 96% secondary school completion rate and 82.2% attaining university admission grades. Some of the Wings to Fly 1st and 2nd cohorts have graduated and are working.